Government of Tanzania is set to construct a new bridge on the Wami Riverin Bagamoyo District at a cost of US $30m. Regional Maintenance Manager Engineer of Tanzania National Roads Agency (TANROADS) Zuhura Amani confirmed the reports and said the government signed the deal with Power Construction Corporation, a Chinese contractor company to build the bridge. “Construction Corporation from China will build the bridge about 870 metres away from the old passage, which is currently in use. Construction is set to start soon after finalization of all preparations as the Chinese contractor is currently continuing with mobilisation works,” Zuhura said. The dimensions of the new bridge will have length of 513.5 metres and width of 11.85metres. The project also includes construction of two roads, each with 3.82 kilometres on either side of the bridge, which will join the new bridge with Chalinze -Segera highway. The construction works are expected to last for at least 2years, according to TANROADS. The current bridge in the Wami River was constructed by the British colonial government. It is 88.75 meters long and located in the middle of steep slopes, sharp corners and unsafe curves. This has caused of so many accidents that occur at the bridge and within its approaches. The bridge is infamously known for its danger and narrowness that allows one vehicle to pass at a time. Wami Bridge is a key feature in the economic development of Tanzania linking Dar es Salaam with other regions to the north. 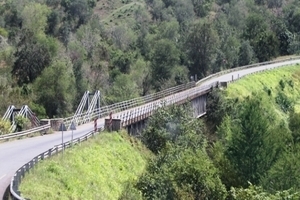 The bridge has over the years proved to be incapable of withstanding heavy weight vehicles. Experts say the new bridge at Wami will avoid the unsafe curves and steep slopes for safety enhancement. Tanzania’s priorities in the 2018/2019 budget are its flagship infrastructure projects and creating a conducive environment for business and investment. 12.9 per cent of the total budget that is US $2.1bn will be directed to major infrastructure projects aimed at making Tanzania a middle-income economy by 2025.